Before we go to SaleHoo review, want to ask a question. Why should you stock up those sales when you have an effective tool called Drop shipping? It’s literally a retail fulfillment method that works up MAGIC in e-commerce. If you are all set to launch your online business but it worries you to purchase in bulk, go for Drop shipping. How it works is simple. You basically purchase the item from a third party and it is shipped directly to the customer. As a merchant, you don’t have to deal with the chaos of getting the product delivered. Wait! Is Drop shipping really useful? According to statistics, more than 80 percent online sellers have listed the lack of a good Drop ship supplier as their biggest worry. When launching or expanding your eCommerce business, Take Drop shipping seriously. You don’t need a heavy upfront investment. All you need is the right partner. This is the partner who will handle all the shipping queries and other logistics for you. Among the many other players in the business, SaleHoo is one of the promising names. Read this review on SaleHoo and see what you are signing up while partnering with this New Zealand-based organisation. Founded in 2005, by Simon Slade and Mark Ling., SaleHoo is a directory that helps you connect with different types of suppliers. If numbers are to be believed, SaleHoo connects you with individuals with over 2.5 million branded products, close to 8000+ drop shippers, liquidators, wholesalers and more. These Big Numbers could mean Big Business for you. That being said, do not confuse SaleHoo with a direct supplier. They do not exchange any merchandise. STEP 1: You need to sign up for a membership to access their services. Sign up for $67 annually with a 60-day money back guarantee. That’s quite a lot of time to evaluate the service, isn’t it? STEP 2: The next step is to look for the categories of the products you want to sell. You will get a list of every supplier selling that product and narrow it down to categories like Drop Shippers Only, Liquidators Only, etc. How do you turn a profit with SaleHoo? SaleHoo helps its customers sell these Drop shipped goods via Amazon, eBay. Whether distributors are running a profitable business with SaleHoo can be debated, the good thing is, it helps Drop shippers can start their own online store through their platform. Sure, they could definitely make the back-end more powerful (the likes of Shopify). Let’s take a look at what SaleHoo offers and if it’s worth your investment. Sure you can create beautiful online stores with Shopify and other players in the market. But is that enough to get a business running? No. This is where SaleHoo will play a significant role. They give you access to low-cost, high profit products for Drop shipping. Their catalogue is super elaborate. And once you have the access to their directory, it just gets more exciting. 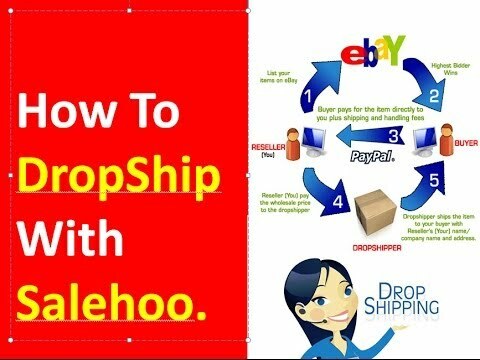 With SaleHoo, you have access to over 8000 Drop shippers and more than 1.6 million items to resell. These are suppliers who sell in the domestic market and internationally. So even if you live in a country with a limited number of suppliers, SaleHoo brings the world market to your window. Pro tip : check out how to find most profitable niche market instantly. What makes SaleHoo stand out is the number of products it gives you access to. You are no longer restricted to a couple of niche brands. At SaleHoo, more than 70 percent suppliers do not require an application fee. The SaleHoo Drop shipping Supplier Directory is pretty impressive. They have a verified list of drop-shipping suppliers. So basically, you don’t have to waste time double checking if they are authentic or not. SaleHoo does all that background check for you.You can rest your worries about timeline deliveries. And there are more categories than you can imagine. You can use various filters to scan through them. Another feature that works in favor of SaleHoo is the number of features it offers. You can manage notes, create supplier lists, visit their websites and even take educational courses that help you understand the market better. Not many players in the field offer that kind of support. If you are a beginner, you might want to dig into their section called Success Stories. You can simply create an online store builder at $27 a month for the Basic plan. The other two plans— $47 for Standard plan and $97 for the Premium plan. There is no expertise required to set up a store. You will get access to 15 professionally designed store templates and can access them. It is easy to use their built-in marketing tools. This is a great option for amateurs who do not want to waste time in learning an elaborate store building process. sell or purchase it, the number of players in the market, the most successful players selling the product in your field, and more. For quite a long time in the business of online marketing, people were unaware of a tool like this. But today, it’s the marketing research that keeps you ahead of the curve. The Market Research Lab of SaleHoo searches Amazon, eBay and AliExpress to get you the best products with a high selling rate. Step #1. Log into your SaleHoo account and click “Discover Products”.Look this up in the Labs menu on the top. Step #2. Pick a category under “Filter by Category”. This should be closest to the type of product you want to sell. If you are unsure, go with “All”. Step #3. To find the most successful products, look for the “Sell Rate” bar to 30-35%. Going below will show you products that haven’t been sold or sold less. Step #4. The next step is the “Average price ($)” bar. You can filter products according to your price preference. When you choose an average of say, for instance, $105, you will see product prices that range from $0 – $105. Step #5. The best part—You can tweak the competition to the level that suits you. Broadly speaking, low competition products don’t have many sellers listing them. It’s a good idea for new sellers as the competition here is low against other sellers. As for high competition, the market is thriving. This is a good option for established sellers. Step #6. Now you’ll be able to see all the popular products for selling online that meet your preferences. It is time to decide which ones you’d like to sell! Don’t forget to consider the other data available to you, such as the average sale price. Step #7. You can SAVE the product and review it later from the tab that says “Saved Product Ideas”. Step #8.After setting all the filters according to your preference, tick the heart in the top right corner. You will get an email periodically with ideas that match the filters. This is probably one of the most important reasons why many go back to SaleHoo. The competition insights offered by SaleHoo are better than many other market analysis tools out there. This is the kind of information that affects profit margins. However, the only issue here is that a lot these items listed in the directory are not cheap enough to sell profitably on eBay and other marketplaces. You will probably think that a lot of these products are selling for less on eBay than one of the wholesalers. But then, again, you can scoop up some sumptuous deals if you stay away from the products that everyone else is selling. We would recommend the use of Google Adwords for better analysis. If you are don’t get instant support from the community, you have other members answering your queries. Yes, SaleHoo is kinda transparent like that. They already have 60,000 posts out there. People discuss all sorts of things like mistakes you should avoid, selling tactics that works, etc. Their low-fee structure comes with unlimited phone support, email, live chat and Facebook support. SaleHoo also offers some 50 guides and videos in case you want step-by-step help. Apart from the regular features that many other drop ship facilitators provide, SaleHoo helps you reply to suppliers through your inbox. They send out notifications so that you never miss out on any message from the suppliers. But here’s our favorite feature from their dashboard— track progress in training modules. These modules include everything from selling on Amazon, Your website, Scam Prevention, etc. You can continue learning by just jumping to any module on your dashboard. The most impressive part about SaleHoo is that it’s easier to find profitable suppliers and resell through the same directory. For other players, for instance, Wholesale2b, customer reviews reveal that they haven’t been able to turn a profit with items on the profile. The website comes with a very impressive Auctions Ending Soon feature in their Market Research. This is a list of live listings that contain your keyword and are due to end soon. You can find out how the others are marketing their products in the auction and learn. You might be paying more money per item, so that sellers can face stiff competition with places like eBay. When you don’t have complete control over inventory, you can be in trouble even if drop shippers mess up. You only pay for what you sell. So there’s no risk involved. You will not be stuck with an item if it doesn’t sell. And there’s no minimum cap on orders. While you are the only user accessing SaleHoo, Oberlo helps you create multiple users accounts for additional virtual assistance. And Drop shippers don’t need to be put through a ringer with Oberlo, unlike SaleHoo. But that can also create more risk. A Burning question- Is it safe? With the markets of products sprawling across the world, there’s plenty of room for the fakes. So, do you know if you are getting a genuine product on SaleHoo? Yes. Don’t think more number of suppliers means more fakes. This is not the case with SaleHoo. Their verification process is strict, eliminating any scope of any fraud. The companies you find on SaleHoo are authentic. It’s definitely not a scam. A quick glance through the website will also help you understand how crystal clear the solution is. In fact, they even calculate the profit for you. And you know where you stand by comparing products by the level of competition, sell-through rate, price, etc. THE BIG QUESTION – So is it for you? Even with such compelling features, we wouldn’t recommend Salehoo for everybody. This is not the place for rock bottom prices. If you are looking for only listing your cheap products by simply listing those products on eBay or Amazon, you’ve come to the wrong place. They do not deal with random wholesale suppliers. This can be tough if you are not willing to do your market research a bit on your own. Doba is a good optionin that case as they offer turn-key Drop shipping. Again, you’ve got to shell out some more money for that to get simplicity and automation.